I’ve always struggled with oily acne-prone skin ever since I was a teenager. I am almost *ahem* 40 years old and I STILL struggle with bad skin! Ugh. I love this homemade DIY face mask for acne recipe with essential oils because it draws out the toxins and leaves my skin refreshed. Once I started using essential oils for my face skin cleaning routine, I noticed a change. My skin got better, then it got worse. Yes, you need to clean your skin to prevent oil and acne, but you also need to treat the scars and get rid of dead skin. 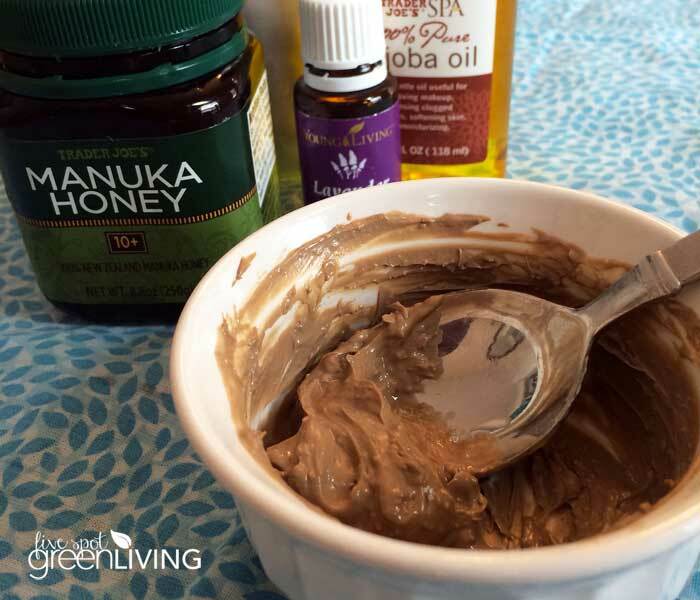 This totally easy all natural homemade face mask will hydrate AND cleanse combination skin. 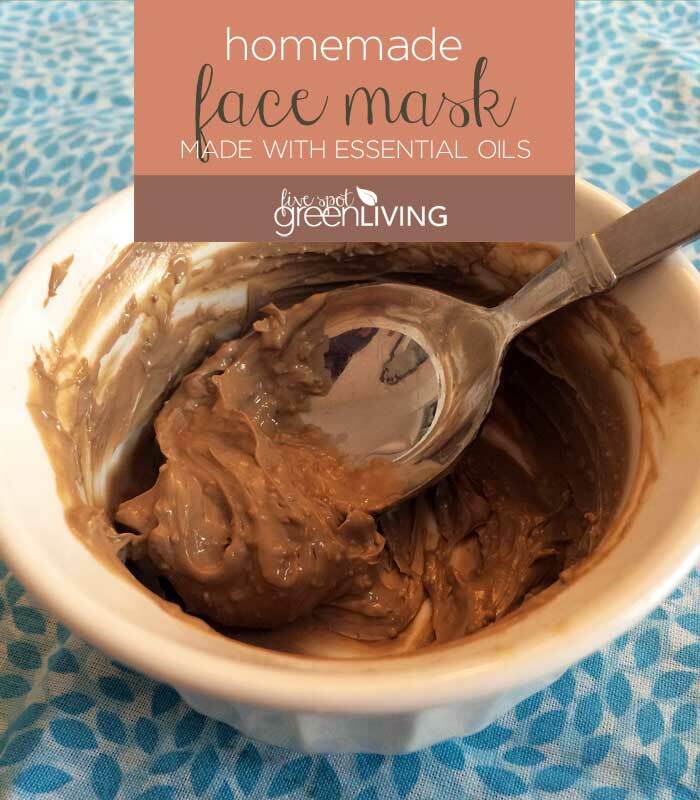 It’s good to use this type of homemade essential oils face mask once a week to reduce the signs of aging and heal the skin. Besides, using 100% pure organic essential oils not only smell wonderful but are super relaxing and soothing after a long day! Kaolin clay is recommended for oily and normal skin. It is an excellent skin care treatment as it helps control sebum production, the major contributor to oily skin. The clay helps in regenerating and mineralizing of the dry areas, leaving your skin smooth and glowing. Kaolin clay contains a compound known as montmorillonite that helps to remove toxins and oils from your skin. It is also rich in phyto-nutrients and essential minerals and is commonly used for therapeutic purposes. Honey is a natural moisturizer. The honey I get from Trader Joe’s is made from bees that feed on the tea tree plant. This is beneficial because tea tree reduces sebum production by the skin. This oil is wonderful for problem skin because it actually dissolves the sebum that clogs your pores which allows your skin to breathe more effectively. 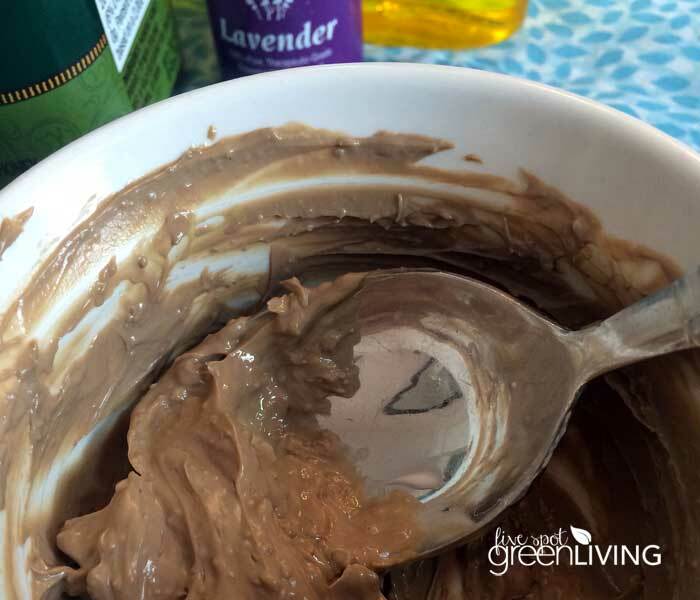 Lavender oil is a wonderful soothing and healing ingredient in this homemade face mask. It can help stimulate new cell growth and regeneration as well as calm the skin. Get Lavender essential oil here! Whisk together all the ingredients except the clay in a small bowl. If the mixture seems too thick, add a little more yogurt but not oil! Clean your face and leave it damp, then smooth the homemade face mask over your face and neck, avoiding your eyes and mouth. Leave it on your face for 15 to 20 minutes. Drink your coffee, read a book, take a bath! Wash the homemade facial mask off using a warm, wet washcloth. This recipe makes enough for one facial application. It doesn’t last long mixed up so wait until you are ready to use to add the clay. If you have trouble with jojoba oil which I actually do, you can substitute it for other carrier oils like coconut, Young Living’s V6 oil (my fave), or others like this. Don’t forget to check out ALL of the natural skin care posts here on this site! Hello Vicki, just wanted to make sure I clarified. The recipe doesn’t list how much clay to use. Did I miss it somewhere? Hi Heather! That’s strange. It should say 1 tablespoon clay. I hope you like it – I liked that it got rid of the oil in my skin but wasn’t drying like other masks. I love a good face mask. I’ll have to try this. Thank you! Our 14 year old needs to try this. I am adding this to my essential oil board! Essential oils can be great for gently cleansing the skin, whatever your skin type. Well written blog. I will try this amazing face mask. Thanks for sharing.